Enjoy international cuisine at Ariadne, one of the property's many dining establishments, which include 2 restaurants and a coffee shop/café. Mingle with other guests at the complimentary reception, held daily. Relax with a refreshing drink from the poolside bar or one of the 3 bars/lounges. Grab a bite at Si La Restaurant, one of the hotel's 3 restaurants, or stay in and take advantage of the room service (during limited hours). Wrap up your day with a drink at the bar/lounge, the beach bar, or the poolside bar. Buffet breakfasts are available daily from 7:30 AM to 10:30 AM for a fee. Mitsis Rinela Beach is located along the Mediterranean coast of Kokkini Chani. It features 3 seawater swimming pools, 2 tennis courts, and 2 water slides for children. The hotel’s beach features a selection of water sports. 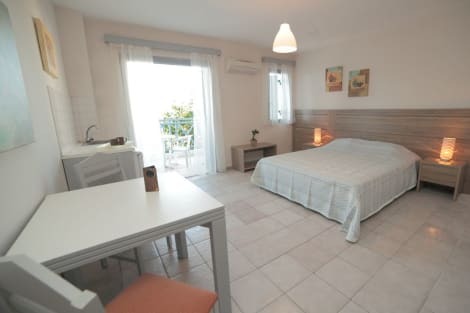 Each with a balcony or terrace overlooking the garden or the sea, Mitsis Rinela Beach's air-conditioned rooms have a warm décor and wooden furniture. Each features a minibar, satellite TV and marble bathroom with bathtub and toiletries. Wi-Fi and safe are available at the lobby upon extra charge. The main restaurant serves an American buffet breakfast, lunch and dinner. It offers local and international cuisine, and features a children’s corner. Mitsis Rinela Beach also features a Chinese restaurant and a tavern-snack bar. Bars are available in the pool area and on the beach. Guests can take part in a number of activities organized by the hotel’s animation team, including aqua aerobics, pool games and beach games. Body and face treatments are also available at the spa centre. 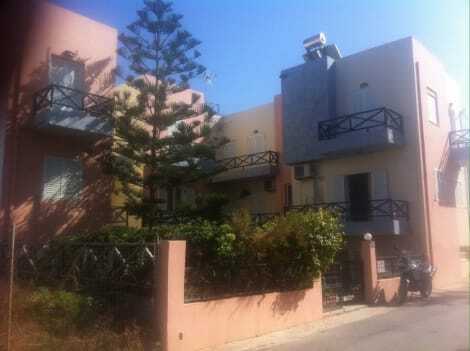 Mitsis Rinela Beach is 10 km from Heraklion Airport and 12 km from the city centre. The Creta Aquarium is only 2 km away, and Watercity is at 1 km. Take advantage of recreation opportunities such as a water park (surcharge) or take in the view from a terrace and a garden. This apartment also features complimentary wireless Internet access, concierge services, and an arcade/game room. Featured amenities include luggage storage, a library, and a safe deposit box at the front desk. A roundtrip airport shuttle is provided for a surcharge (available on request), and free self parking is available onsite. Make yourself at home in one of the 19 air-conditioned rooms featuring refrigerators and flat-screen televisions. Complimentary wireless Internet access keeps you connected, and satellite programming is available for your entertainment. Bathrooms have showers and hair dryers. Conveniences include phones and blackout drapes/curtains, and housekeeping is provided daily. lastminute.com has a fantastic range of hotels in Kokkini Hani, with everything from cheap hotels to luxurious five star accommodation available. We like to live up to our last minute name so remember you can book any one of our excellent Kokkini Hani hotels up until midnight and stay the same night.